Rangpur Riders clinched playoff spot as the fourth team following their 19-run victory over Khulna Titans in the 38th match of AKS BPL 2017 Powered by Shah Cement. Mahmudullah won the toss and opted to bowl first at Sher-e-Bangla National Cricket Stadium (SBNCS). Chris Gayle scored 38 and gave a good start to Rangpur Riders. After his departure, it was Mohammad Mithun who carried the Rangpur innings with an unbeaten knock of 50 off 35 balls. Rangpur posted 147 for 6 after 20 overs. Jofra Archer picked up 2 wickets for 28. 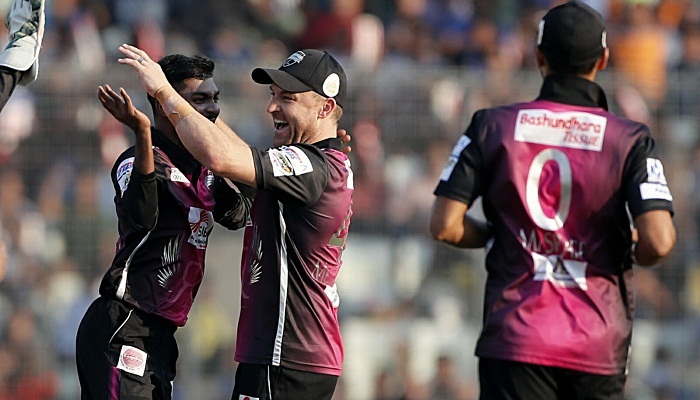 In reply Nazmul Hossain Shanto and Michael Klinger gave Khulna Titans a steady start with a 60-run stand. But Rangpur Riders bowlers fought back by picking up couple of wickets in quick-succession. Khulna finally managed to score 128 for 8 in 20 overs and lost the match by 19 runs. Mohammad Mithun was adjudged man of the match. Result: Rangpur Riders won by 19 runs.